Apotheca by Inner Ego is a unique range of organic powdered tonics designed to target daily ailments with ancient herbal remedies. 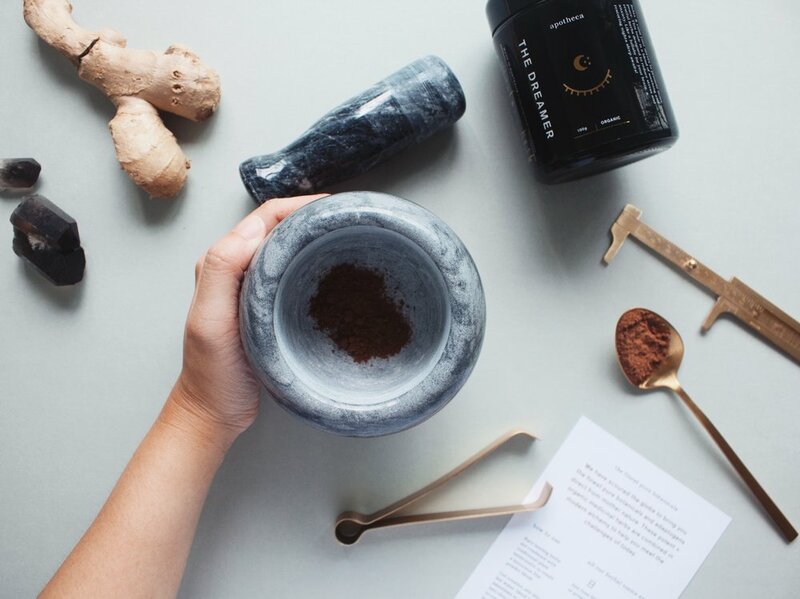 With a desire to bringing the finest pure botanicals direct from mother nature, Apotheca is conceptualised by Lynda Scantlebury, the co-founder of Inner Ego, a cold-pressed juice company based in Perth, Australia, who is passionate for healthy living and eating. Apotheca flourishes in a rich repository of adaptogens infused with premium properties that restores a balance and harmony back into our bodies. These four tonics, namely: The Immortal, The Dreamer, The Powerful and The Healer contains potent and medicinal herbs that have been combined in modern alchemy to help meet the challenges of today. The universal language of the packaging system and collaterals created, derives from the underlining restorative processes that takes place skin deep within a person. The communicative concept and visual expression is met with illustrated iconology and symbology with the implementation of gold foils and black & white colour palette adds layers of clarity. The balance of icons are bold; deeply-rooted from the characteristics of each —taking a central prominent position on the frontal jar packagings and collaterals. The use of gold foil and intense black envelops and converts the base ingredients into universal elixirs translating the four remedies. The Immortal adorns a vase that promotes beauty and life with its elixir. The Dreamer portrays a closed eye as she envisions at ease. The Powerful is a tower in its strong stand hold. The Healer draws a hand that springs in vitality through a waterfall. Collaterals were extended to drawstring bag and promotional materials.